A fire broke out at SMK St Teresa on the 29th of October 2016. The upper level of our hall was totally destroyed and 20% of the lower floor was damaged as well. 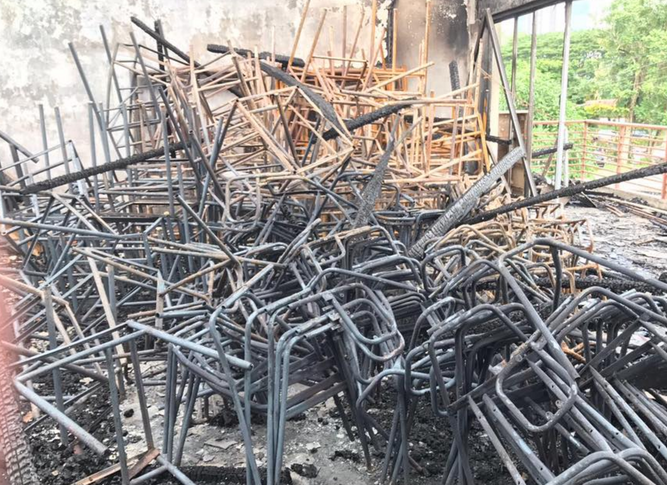 Some of the materials ruined by the fire include 431 sets of desks and chairs for students, textbooks for 2017, and PA systems. The two-storey building also housed the staff room, library, counselling room, surau, sewing room, living skills room, and music room. Moreover, because the school lacks sufficient classrooms, certain parts of the hall were also constantly used to house students from “floating classes”. While further inspection is still underway and some parts of the hall may look intact, the Bomba has advised that the entire building is not safe for use. The school, along with the PIBG (Parents Teachers Association) will be collabrate with the Old Teresian Association to lead the fundraising efforts for both the above. We have managed to consult the contractor and received quotations for what we will need. To replace the ruined hall with a new three-storey block, we need an estimated RM8.2 milllion. After discussions with various authorities, including the Ministry of Education, it was decided that a new four-storey building will be constructed. This new building will also provide the extra classrooms we are in dire need of along with some subject-based rooms. We are grateful to the Chief Minister of Sarawak, who has given us a grant of RM1 milllion towards the rebuilding of the school. The Ministry of Education has also promised to match the funds we collect, which means that if we can raise 50%, they will help pitch in the remaining funds required. The PIBG and the Old Teresian Association will continue working to raise over RM3million that we still need. It will take 3 to 4 years before the school hall is completed. However, we only have 8 weeks before the start of the new school term to ensure that teaching and learning can carried out as usual. 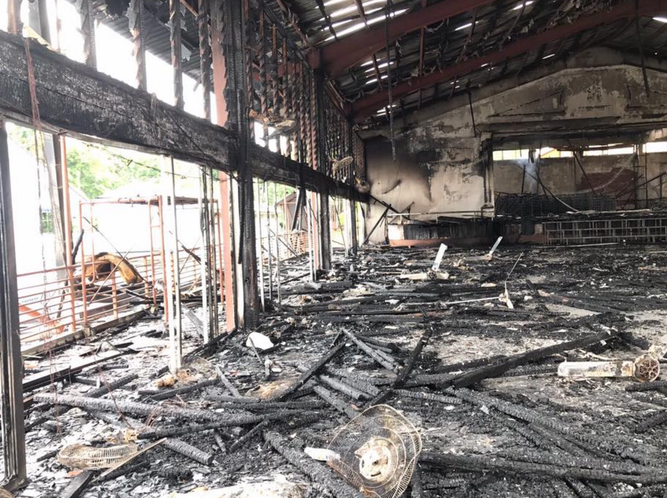 Considering the fact that the school administration has been thinking of building a new structure to cater to the lack of classrooms even before the fire, we have decided to carry on with this plan in stages and use the rooms in the unaffected block for our immediate and interim needs. When the hall has been rebuilt, this structure will be reverted to its original objective of housing the much-needed additional classrooms besides serving in present purpose. We are organising a fundraising here for our most immediate need, which is the interim solution. To be most efficient while staying optimal, we aim to construct the building using the Integrated Building System (IBS) which can be put together quickly starting in December, after SPM, and be completed by March. This is because IBS uses ready-made pieces that simply need to be installed. These rooms will serve as temporary staff rooms, living skills room, and counselling room. The plan is to erect 2 rooms, which will come to about RM105,700. You can find the more detailed budget displayed below. With only a very short timeline to provide solutions, we need to have as much flexibility and funds at the school’s disposal. SMK St Teresa needs you! Please provide your name and details of your bank-in and email to [email protected]. 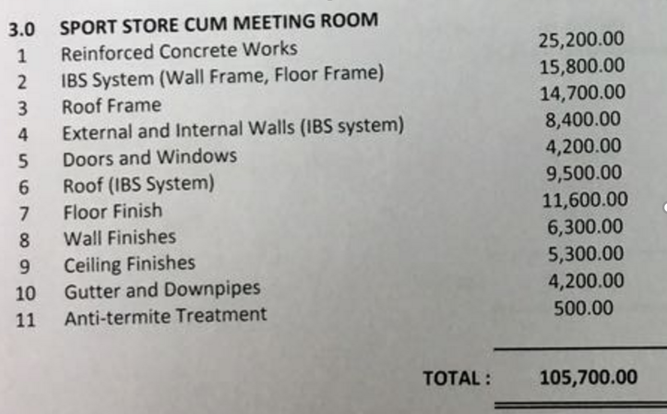 You may mark your contributions as “Hall Rebuilding Fund”.